When it comes to new motherhood and the number of helpful apps popping up, it seems the odds are ever in our favor. Whether it’s tracking the size of your growing belly from bump to beach ball or keeping tabs on nursing or milestones, we’ve put together ten of the very best apps for new moms and new parents (because, dads). While they’re all available for iOS, most are available for Android too, or are coming soon, and there are even plenty of free apps here. Hope you find each one smart, helpful, and definitely worth a download. 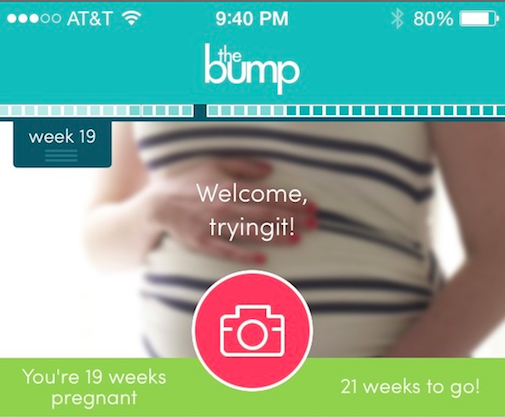 We loved the original Bump app, and now version 2.0 is totally redesigned and streamlined and even handier than before. There’s plenty to read and research on how to keep mother and baby-to-be happy and healthy, all organized in a clean, easy-to-navigate interface. By tapping the “read more” tab, you can dig into thousands of articles and Q&As with intel from The Bump website’s experts and editors on what’s happening with your body and baby from week to week. There’s also a community section, which houses the support forums — and we’re talking a group of 15 million moms and moms-to-be. If it takes a village, this is more like a wildly large city. I also like that you can now upload and share pics of your belly, which can later be inserted into a slideshow, and the “your baby is as big as a xyz-fruit” aspect is also cute. My younger sister is pregnant with her first and sends me the weekly fruit info on my upcoming niece or nephew. Always makes me smile. And a little hungry. 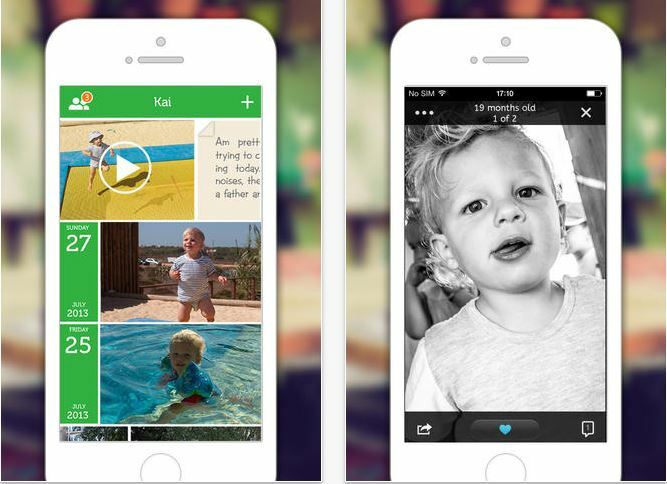 It’s an oldie but goodie, and one that we’ve covered in our roundup of the best newborn apps. The app is a definite friend to nursing moms; when I was breastfeeding my son, I went old-school and used a journal to try to keep track of the nursing schedule which made me a little dizzy, to be honest. If a stranger had flipped open that notebook, they would have sworn I was writing code for a new web site or something with all my notations and abbreviations. This app, however, keeps it simple. 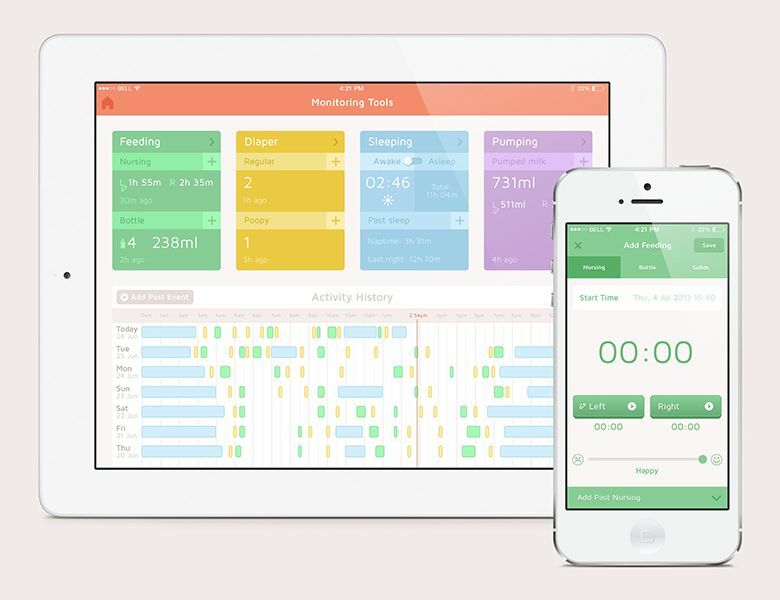 The stopwatch timer and nursing history log are aces, making it easy to see patterns and share the info with your doctor or lactation consultant. 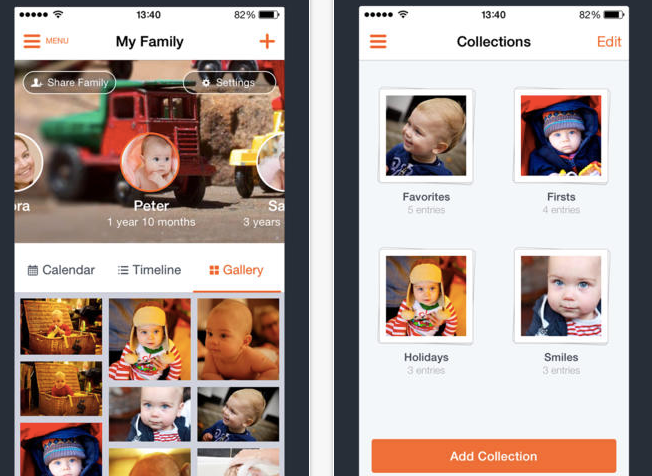 Plus, you can track up to six kids on the app — twins, triplets, easy-peasy. Uh, well, the nursing tracking part of it, anyway. 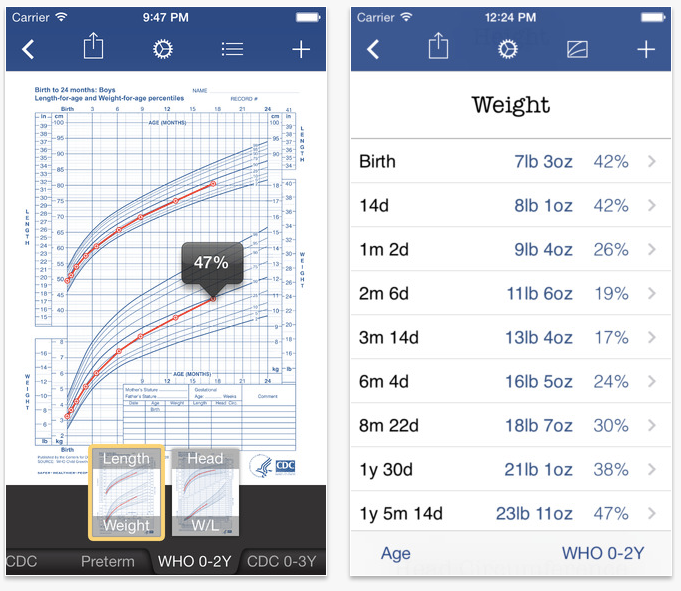 New moms will appreciate this app that allows you to chart infants as they grow (too quickly!) into big kids. No more sheets of pesky paper that gets misplaced the minute you leave the pediatrician’s office. You can choose the official WHO or CDC templates from birth to 20 years old used by pediatricians, or opt for a dynamic chart that’s tailored to your child’s growth span. There’s also a dedicated chart for preemies. But the absolute best part: No passwords or account log-in info to remember. It’s ready when you are. We originally referred to the cool new newborn app, Baby Bundle, as doing everything but changing the diapers for you. And with a brand new update just out, it now does one more thing: It allows multi-child functionality. Wow. So when you’re tracking those newborn activities like eating, sleeping, diaper changes, and vaccinations, you can do the same for a twin (or triplet) or even an older sibling. 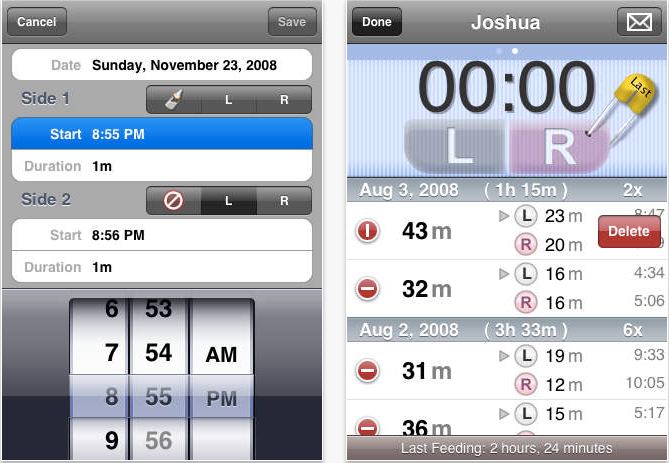 It also offers a what to expect kind of guide, a breastfeeding timer…you name it. See our original review for the full functionality and you’ll be impressed too. Plus it looks so gorgeous. Bonus: You can pay for an upgrade and turn it into a baby monitor too. See? It really does do it all. If it seems like we’re always singing this app’s praises, it’s because we kind of are. The DayOne app is easy, it’s intuitive, and can help you make up for lost time. I know I had full intentions of keeping up with my son’s book, but then life took over. That’s the thing–with DayOne I can record this life as it’s happening. It’s photo-driven and so so simple to use. Add captions, longer journal entries, tags, and keywords to your pic. And more, you can then export all your entries to a PDF and printing books for different child, different moments, different milestones and all the memories. Plus, it’s got the most accurate voice recognition ever if you’re dictating entries while you nurse; definitely puts Siri to shame. 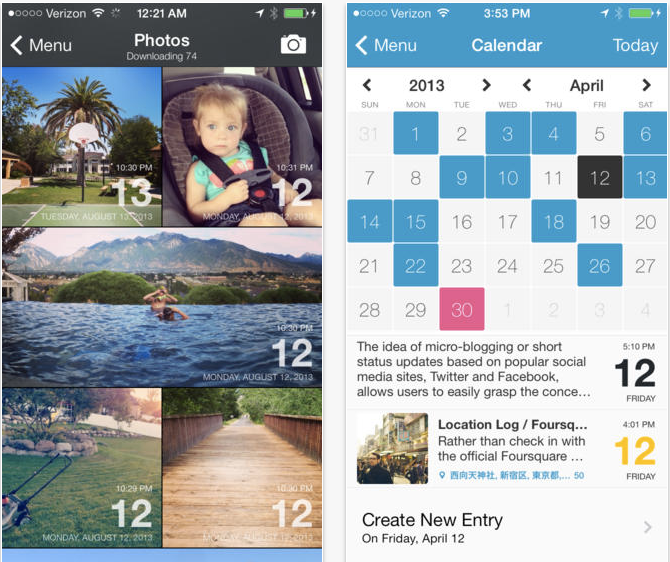 DayOne may remain the one to beat in the online journaling category, but I can also recommend the journaling-meets-photo app hybrid Lifecake. With its built-in timeline based on your baby’s birthdate and easy-share options, you can invite family to check out the young one’s timeline of thrilling firsts on the website or send it out in full to specific folks (i.e, grandparents). This means no more email attachments, people. Rejoice. Gift alert: You can also create a bound hardcover book of your child’s photo timeline. The best description I’ve heard for this free photo album app is that it’s a mini Facebook for parents. (Only you actually see today’s news in your timeline today. Ha.) 23snaps lets you set up a “profile” for each child with a name, birthdate and avatar, then post photos, videos, status updates, and even height and weight measurements. A nice plus: You and a partner can both update your kids’ profiles from separate devices which beats sending relative two photo streams for every big event in your life. You privately share your account with family and close friends, and then your lucky inner circle may add smiles, hearts (like Instagram) and comments to your posts. And, as with IG, you can add filters, frames and vignettes to your pics, too. Oh, and don’t worry, 23 is not a limit on the number of photos you’re allowed to add. It’s actually inspired by the 23 pairs of chromosomes that make up a human’s genetic code. So go ahead and add those picture by the tens. 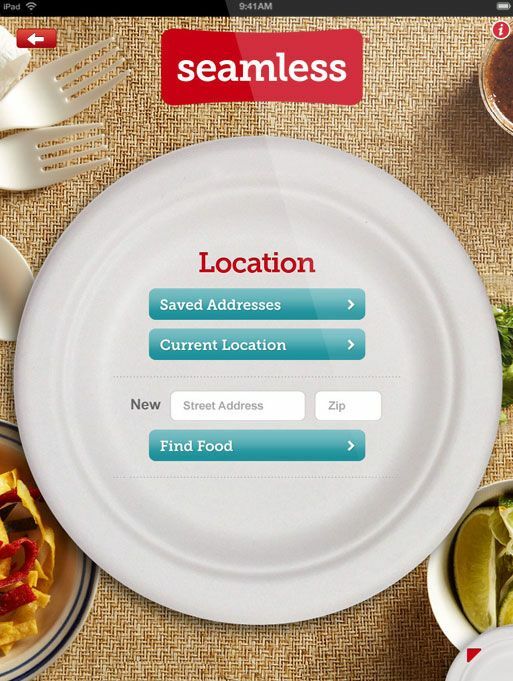 The 23snaps family album may be accessed by any smartphone, online or email. Plus, ordering photo books and prints from your private collection is pretty simple. Let’s be real: Pregnant ladies hit the loo often. And when you’re out and about, knowing where the closest restroom is kind of top-list important information. My son was born when we still lived in NYC, so being caught in the middle of the busy city with the baby elbowing my bladder was not ideal. 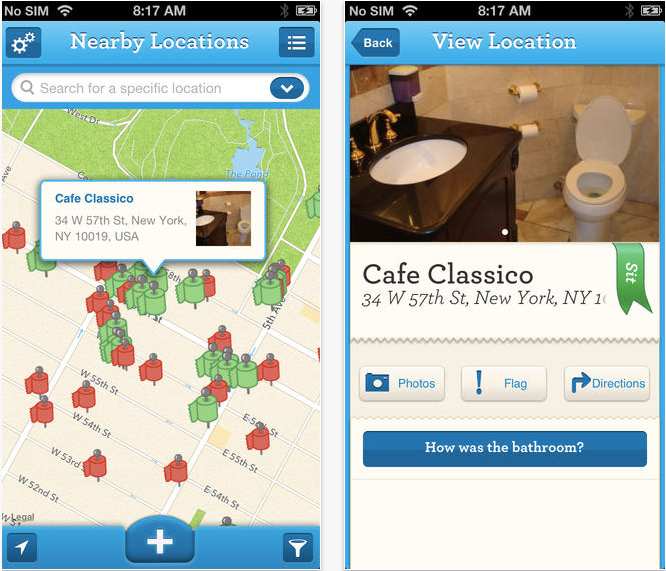 I wish I had this cheeky Charmin-created app that helps you locate clean public restrooms with crowd-sourced reviews. It also comes in handy for new moms looking for clean bathrooms to change the little one’s diaper, or for a potty break for a desperate toddler. New mom or seasoned pro, everyone can use a break from meal prep duties. If you’re in one of the country’s top cities (NY, LA, Boston, Chicago, Philly, San Francisco, DC) wouldn’t you rather skip pizza and tap in your order to your fave local restaurant right there on your smart device? Don’t answer, because it’s always yes. You don’t even have to be home. Order your sushi, Thai, Indian or whatever you’d like while you’re in the bookstore, enduring a marathon nursing session, or on a playdate. Plus, there are discounts and deals to be had. I also use Keepy. Maybe you should check it out. 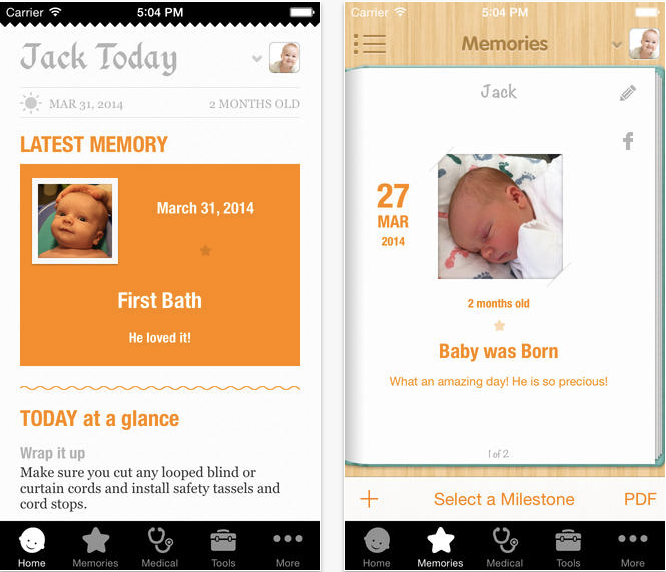 Please also check out our Baby Diaries app as it combines a number of the above functions into one simple, free App. There is also a Plus version that allows parents to sync baby’s information with the nanny/babysitter, ensuring parents never miss a moment of their little one’s day. A new app, available only for iOS for the time being is Super Pic, you can find it here: https://itunes.apple.com/us/app/superpic-simple-private-photo/id1003581860?mt=8. Wow. This is a great list!. Lots of good stuff for “tech-moms” lol. An App I have used which I found super-helpful is the Baby Development Guide from Google Play – https://play.google.com/store/apps/details?id=com.cbbl.babydevelopment it has been great at help me keep track of my daughter’s development milestones. It’s the very helpful list. This is a long list and lots of great apps. The boatload of tracking in some of them sounds kind of intimidating to me as a pediatrician. I wonder how a new mom will have all the time between her baby and inputting all that data. I guess they can multitask or what…….nah. I don’t think so. I love the Baby Tracker nursing app. It seems to be the one I think mothers can do most easily. I like to see breastfeeding logs and wet diaper/soiled diaper logs especially in the first few visits after mommy goes home with her baby. Thanks for this nice list. Baby Stats (www.baby-stats.com) is the best one since it’s hands free on Alexa or Google Assistant. Check it out. Breastfeeding Central is another great app – has loads of tips that make breastfeeding easier, a handy bookmarking feature and a directory for finding local breastfeeding help. Was created by a lactation consultant.